Although our program is called SSAA Farmer Assist and its primary focus is on asset protection, SSAA members can also help landholders who need assistance maintaining species of conservation value on their properties. Feral predators such as feral cats, foxes and wild dogs have a tremendous negative impact on our native animals. There are also numerous grazing pests that can have negative impacts on native habitat too. Shooting can be an effective conservation tool, especially when used to minimise or prevent the impacts that pest animals have on our native animals and habitat. The SSAA has a proud history of undertaking shooting activities with a conservation focus in mind. 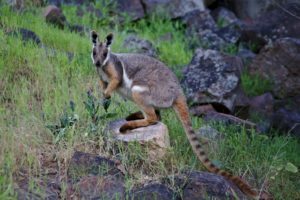 We have undertaken many projects since the early 1990s that have protected native species such as the yellow-footed rock wallaby, bridled nail-tail wallaby, mallee fowl, bilbies and most recently, western quolls. The SSAA has conducted activities in all corners of the country. From Western Australia across to South Australia and Victoria, up to Far North Queensland and across to Northern Territory, we have the country covered. We have worked with various state government departments and private conservation groups to protect native species from the impacts of pest animals. We regularly communicate with the Australian Government’s Threatened Species Commissioner, to find ways to engage more of our members to undertake feral cat (and other predator) control. We are determined to help the commissioner protect Australia’s threatened species and will work as hard as we can to ensure the Federal Government’s 2020 feral cat cull target is met. The SSAA Farmer Assist program enables landholders and managers to find licensed, accredited and insured volunteer shooters to assist with pest control for conservation purposes. We have thousands of qualified members across the country ready to help landholders and managers. It only takes a few minutes to register for the SSAA Farmer Assist program so you can find friendly and willing volunteers to assist you with your conservation goals. Our Conservation & Wildlife Management branch has the motto 'Preserving Australia's Heritage'. This is something that the SSAA has achieved and will continue to do into the future.